Chickpeas are popping up more and more lately. I’m so happy about this. I’ve been on the chickpea bandwagon for years! 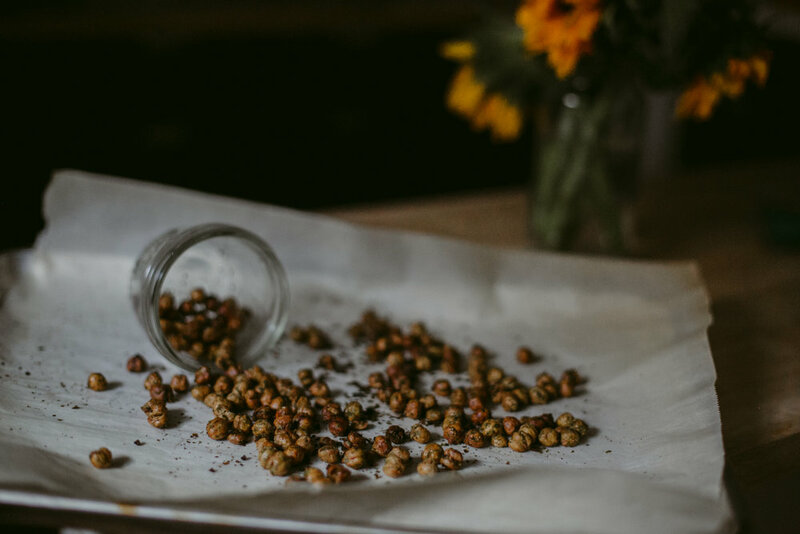 Skip the store bought crispy roasted chickpeas, and make your own with some seaweed seasoning. When you add Blue Evolution’s seasoning blend to the mix, crispy chickpeas hit a whole new level of delicious. It’s just the right amount of seaweed flavor. I can only make these as a cocktail hour treat to be shared or when I’m having company over because I have no self control and will eat them all. If sharing, I highly recommend doubling the recipe. Make sure to follow my notes about getting your chickpeas ready for the oven so you can achieve a good crunch. Add your chickpeas to the center of clean dry towel. Fold the towel over the chickpeas and using the palms of your hands rub the chickpeas around. This both dries the chickpeas and removes the skin. Discard the skins. I’m not too picky about getting them off and either way I have good results. For a crispier final product, place the chickpeas on a baking sheet and let them dry further, for about an hour. Drier the better, but often I skip this step. Preheat your oven to 400 degrees. Prepare a baking sheet with parchment paper. In a medium mixing bowl combine all ingredients and toss until chickpeas are coated. Taste and adjust accordingly – maybe a bit more seaweed, maybe a bit more garlic. I went for a subtle seaweed kick. Spread chickpeas onto prepared baking sheet. Make sure they aren’t too crowded to help them get crispier. Place in you oven on the top or bottom rack and bake for 40-45 minutes, tossing every so often. Test around 40 minutes. If they’re close to perfect crispiness, they’re done. They’ll continue to firm up outside of the oven. Notes: If you want a little spice add some cayenne. If you want cheesy seaweed deliciousness, add some nutritional yeast. Or add both. I’m definitely doing that next time!